I have solution & project in Visual Studio 2012. The project has a file packages.config in the root of the project. For the purposes of this question, lets assume I accidentally removed these libraries from the References section of my project. When going into NuGet package manager, the interface is still reporting a tick next to these packages, indicating they are installed. The only way I can see how to fix this situation is to delete all the entries from packages.config, which will fix the issue of the NuGet interface reporting them as installed, and re-add each one. Is there a smarter way? I had hoped enabling 'enable nuget to restore missing packages' would solve this, but it doesnt seem to do anything. If you want to re-install packages and restore references for the whole solution omit the -ProjectName parameter. You need to Enable NuGet package restore at the VS solution level for the restore missing package to work. In case this helps someone, for me, none of the above was sufficient. I still couldn't build, VS still couldn't find the references. The key was simply to close and reopen the solution after restoring the packages. But no matter what the approach, those references will still be shown as missing. And when you build it will fail. Sigh. However if you close the solution and re-open it, now VS checks those nice <HintPath>s again, finds that the packages are back where they belong, and all is well with the world. Is Visual Studio still not seeing that you have the package? Still showing a reference that it can't resolve? Make sure that the version of package you restored is exactly the same as the <HintPath> in your .csproj file. Even a minor bug fix number (e.g. 1.10.1 to 1.10.2) will cause the reference to fail. You can fix this either by directly editing your csproj xml, or else by removing the reference and making a new one pointing at the newly-restored version in the packages directory. While the solution provided by @jmfenoll works, it updates to the latest packages. In my case, having installed beta2 (prerelease) it updated all of the libs to RC1 (which had a bug). Thus the above solution does only half of the job. Credits go to Dan Haywood and his blog post. The following script can be run in the Package Manger Console window, and will remove all packages from each project in your solution before reinstalling them. This will run every package's install script again, which should restore the missing assembly references. Unfortunately, all the other stuff that install scripts can do -- like creating files and modifying configs -- will also happen again. You'll probably want to start with a clean working copy, and use your SCM tool to pick and choose what changes in your project to keep and which to ignore. I added the DLLs manually. Right clicked on References in the project, select Add Reference and then in the dialog pressed the Browse button. The NuGet DLLs where in the packages directory of the solution. To get the names of them you can right click on references in another project that's working properly and select properties and look in the path property. In Visual Studio 2015 (Soulution is under source control, MVC-Project), csano's Update-Package -Reinstall -ProjectName Your.Project.Name worked, but it messed up with some write locks. I had to delete the "packages"-Folder manually before. (It seemed to be locked because of the source control). Also, I had to re-install the MVC-Package from the NuGet Package Manager. Just in case it helps someone - In my scenario, I have some shared libraries (Which have their own TFS projects/solutions) all combined into one solution. Nuget would restore projects successfully, but the DLL would be missing. The underlying issue was that, whilst your solution has its own packages folder and has restored them correctly to that folder, the project file (e.g. .csproj) is referencing a different project which may not have the package downloaded. Open the file in a text editor to see where your references are coming from. This can occur when managing packages on different interlinked shared solutions - since you probably want to make sure all DLLs are on the same level you might set this at the top level. This means it that sometimes it will be looking in a completely different solution for a referenced DLL and so if you don't have all projects/solutions downloaded and up-to-date then you may get the above problem. I have to agree with @Juri that the vastly popular answer by jmfenoll is not complete. In the case of broken references, I submit that most of the time you do not want to update to the latest package, but only fix your references to the current versions that you happen to be using. And Juri provided a handy function Sync-References to do just that. One solution built just fine, one solution had one project with missing references (EF, System.Http, as instance), but the relative nuget packages were properly installed. All version numbers in project and packages match, doing nuget restore (in all its ways) did not work. How I fixed it: simply delete the package folders in the solution root and execute nuget restore. At this point the dlls are correctly downloaded and can be added for the missing references. also this link helps https://docs.nuget.org/consume/package-restore/migrating-to-automatic-package-restore. Not the answer you're looking for? Browse other questions tagged visual-studio-2012 nuget or ask your own question. How do I enable NuGet Package Restore in Visual Studio? 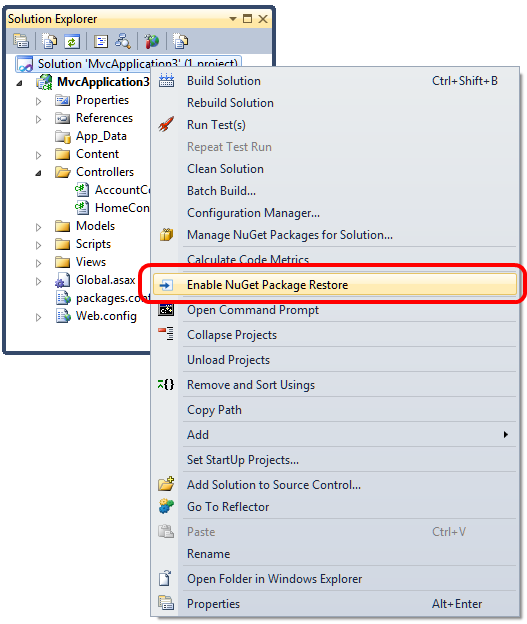 How to enable nugets package restore in Visual Studio 2015?